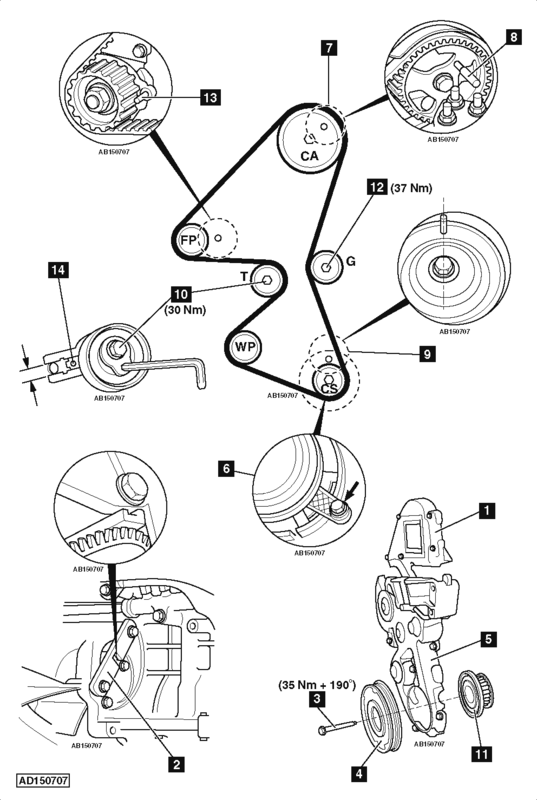 Ford recommend replacement every 125,000 miles or 10 years (tensioner pulley and guide pulley must also be replaced). Camshaft sprocket locking tool – No.303-735. Crankshaft aligning tool – No.303-732. Flywheel locking tool – No.303-393. Remove coolant expansion tank. Move to one side. Disconnect crankshaft position (CKP) sensor. Move aside engine wiring harness (on timing belt cover). Fit flywheel locking tool  . Tool No.303-393. Fit crankshaft pulley bolt  . Tightening torque: 20 Nm. Turn crankshaft slowly clockwise until camshaft sprocket timing hole at 2 o’clock position  . Crankshaft aligning tool  . Tool No.303-732. NOTE: Ensure crankshaft position (CKP) sensor reluctor is not damaged. Fit new guide pulley. Tighten nut  . Tightening torque: 37 Nm. Insert suitable locking tool (6 mm) in high-pressure fuel pump  . Fit timing belt loosely to sprockets, guide pulley and tensioner pulley. Crankshaft pulley bolt  . Tighten bolt finger tight. Tighten tensioner pulley bolt  . Tightening torque: 30 Nm. High-pressure fuel pump locking tool  . Fit timing belt guide  . Turn crankshaft slowly 10 turns clockwise. Ensure camshaft sprocket timing hole at 2 o’clock position  . Crankshaft pulley bolt  . Use new bolt. Tightening torque: 35 Nm + 190°.